Reward your pup with a delicious and nutritious treat with these Holistic Blend Cinna Cran Hearts Biscuits for Dogs. 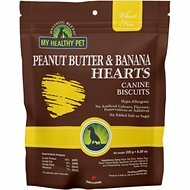 These tasty heart-shaped doggy biscuits are low in fat but high in flavor. Now pet parents can feel especially good giving their canine companion a treat knowing there are no artificial flavors, colors or preservatives! These hypo-allergenic and wheat-free treats are made with organic cinnamon have a crunchy texture that helps control plaque and tartar build-up and promotes fresh breath, clean teeth and healthy gums. Give your pet the holistic nutrition he needs with Holistic Blend! Wheat-free, hypoallergenic treats are also low in fat so you can give your pal a guilt-free reward. 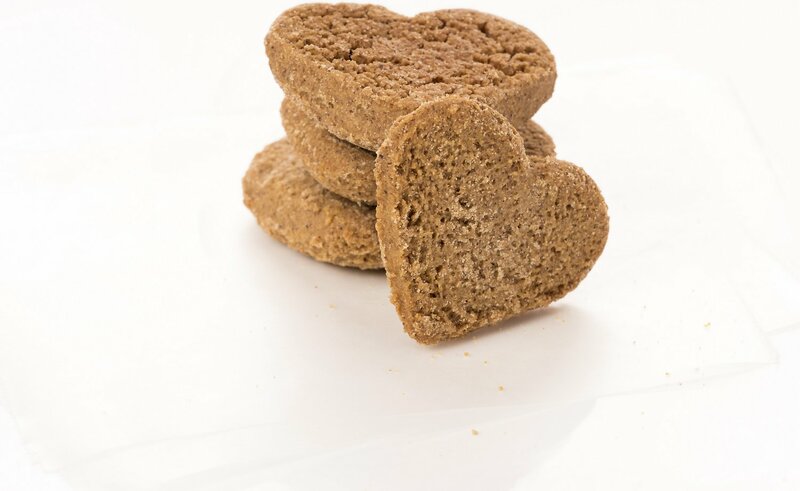 Heart-shaped doggy biscuits are made with organic cinnamon for a delicious natural flavor. Crunchy biscuit texture helps to control plaque and tartar build-up to help improve your furry friend's dental hygiene. Made without artificial flavors, colors, preservatives or additives because your pup deserves nothing but the best. Every Holisitic Blend product is made in Canada with high-quality ingredients only sourced from Canada, New Zealand and the USA. Barley Flour, Oat Flour, Yellow Pea Flour, Sunflower Oil (With Vitamin E as a Preservative), Cinnamon, Honey, Cranberry Powder, Ground Rosemary. Feed as a treat or use as a training aid. What makes Holistic Blend® formulas unique? Why does the quality of food make a difference in my pet's health? Food is the body's fuel, and life does not exist without it. Your pet's health, behavior, temperament, longevity, ability to reproduce successfully and to recover from trauma depends greatly upon properly administered and sustained nutrition. "You are what you eat." Would you say Holistic Blend® is 100% completely balanced? Holistic Blend® has been formulated to exceed the standards set by AAFCO nutrient profiles. However, all pet foods when cooked or baked at a temperature exceeding 290 degrees Fahrenheit will cause some of the vitamins and minerals to be destroyed. We don't believe any pet food manufactured under these conditions to be 100% completely balanced, and suggest supplementing to obtain the maximum level of nutrition. Why doesn't Holistic Blend® add probiotics, digestive enzymes or glucosamine to their pet food formulas? Contrary to what other commercial pet feed companies will tell you, probiotics and digestive enzymes are heat - sensitive, and are destroyed at 120 degrees Fahrenheit. Remember, other commercial pet feed is cooked or baked at a minimum of 290 degrees Fahrenheit. When you buy Probiotics, Digestive enzymes or Glucosamine, they are all refrigerated. What are BHA and BHT? Both BHA and BHT are Synthetic chemical preservatives that prevent the fatty contents of the pet food from going rancid. They provide endless shelf life. Both have been suspected of being carcinogenic. BHA and BHT inhibit the immune system as well as the absorption of glucose. My 14 year old Toy Fox Terrier will not eat them. I got them for his teeth and breath because they were not real hared to chew. I bought 2 bags but he doesn't like them. Maybe it is the flavor. 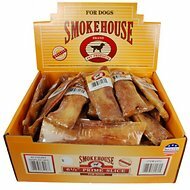 I was looking for some healthy treats to feed to my three dogs and decided to try this for them. It is a healthy product but one of my dogs has epilepsy and cannot have rosemary as it can cause seizures. The listed ingredients do not show rosemary here but when I opened up the chewy box, the treat bag shows that the sunflower oil is preserved with rosemary, so I cannot feed these to my epileptic dog. I would recommend this product to dogs who do not have epilepsy but all of the ingredients should be listed.